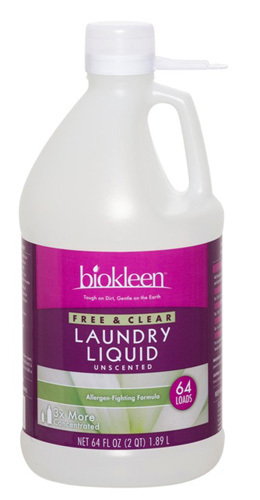 Our Free & Clear laundry liquid is fragrance free, and like all biokleen products is clear of dyes and brighteners. Removes the toughest dirt, grease, stains and odors, yet is gentle enough for cloth diapers, delicate fabrics and hand washables. Rinses clean leaving no residues on clothes that can irritate skin or ruin fabrics. Allergen Fighting Formula. INGREDIENTS: Surfactants and conditioners from coconut and/or corn, grapefruit seed and pulp extract (no scent), linear sulfonate, filtered water.